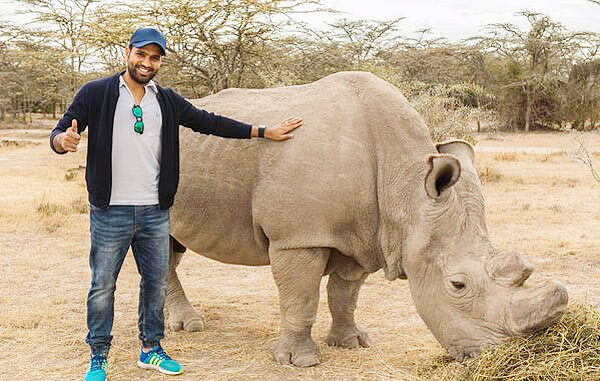 It was named Sudan, aged around 45 and in Kenya, rangers had risked their lives to keep the ageing rhino safe ...... Rohit Sharma once stood by him, as did Masai warriors and one could wonder why 24 hours armed guards for a rhino devoid of even horns ~and how Sudan was the last hope !! The northern white rhinoceros (Ceratotherium simum cottoni), is one of the two subspecies of the white rhinoceros. Formerly found in several countries in East and Central Africa south of the Sahara, it is considered critically endangered or Extinct in the Wild. This subspecies is a grazer in grasslands and savanna woodlands. After 2000, six northern white rhinoceros had lived in the Dvůr Králové Zoo in the Czech Republic but four of them (which were also the only reproductive animals of this subspecies) were transported to Ol Pejeta Conservancy in Kenya, Africa, in 2009, where scientists hoped they would successfully breed and save this subspecies from extinction. This is what extinction looked like. No meteor from outer space, no unstoppable pandemic, no heroic, ultimately futile, last stand. Instead, poor sperm, weak knees and ovarian cysts mark the end of a lifeline cut short by human greed, ignorance and indifference. The demise of this species, is an indictment of what the human race is doing to planet earth and it’s not just happening to rhinos. ~ and sadly, it is ‘the end of a species’. : on 19th Mar 2018, the last male northern white rhino died in Kenya, leaving his daughter and granddaughter as the only two of their kind in the world. Media reports stated that the 45-year-old was euthanised after suffering from degenerative muscle and bone condition. 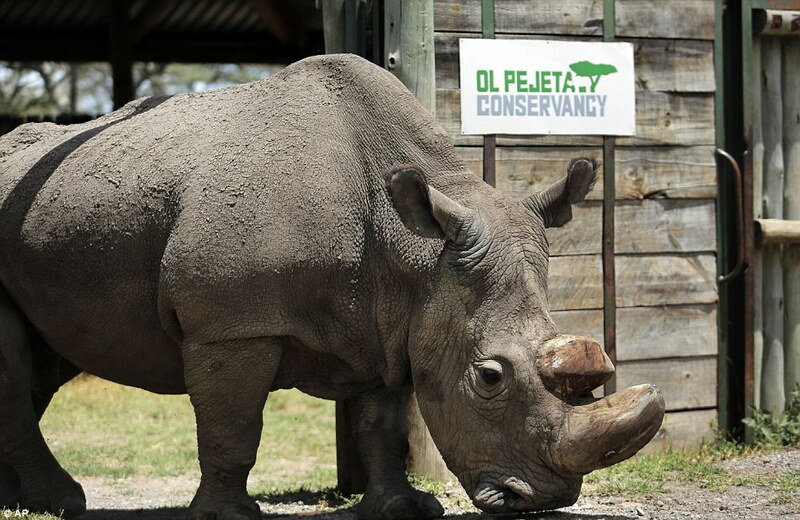 Sudan, who was named after the country of his birth, had been transported to Kenya in 2009 with three other white rhinos in the hope they would breed, but never did. It is stated that Scientists have gathered his genetic material and hope to develop IVF techniques to preserve the species. The rhino, named Sudan, was suffering from a degenerative muscle and bone condition linked to age when keepers found he was unable to stand up and made the decision to euthanise him. 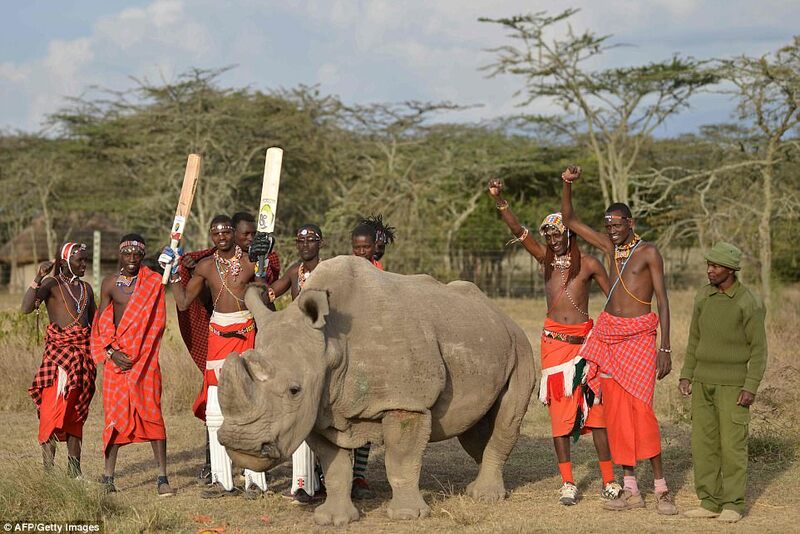 With his demise only Science and IVF techniques offer some hope to have any white rhinos. Najin, Sudan's daughter, and Patu, his granddaughter, are now the only two living members of the species. When Sudan was born in the early 1970s there were believed to be around 500 northern white rhino living in central Africa, but that population was reduced to just 15 by the middle of the following decade. The northern white rhino population in Uganda, Central African Republic, Sudan and Chad was largely wiped out during the poaching crisis of the 1970s and 80s, fueled by demand for rhino horn in traditional Chinese medicine in Asia and dagger handles in Yemen. A final remaining wild population of about 20-30 rhinos in the Democratic Republic of Congo was killed in fighting in the late nineties and early 2000s, and by 2008 the northern white rhino was considered extinct in the wild. 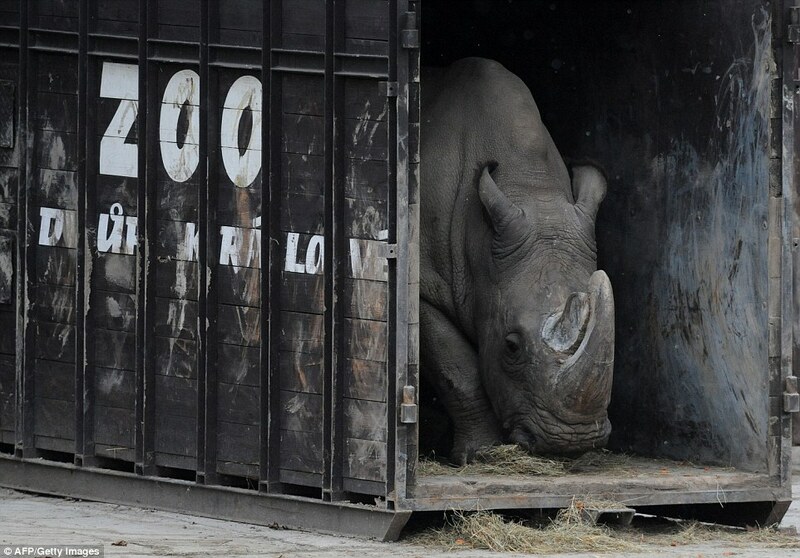 Sudan was captured in the wild in 1973 at around three years old before being shipped to a zoo in the Czech Republic as part of their northern white rhino display. He spent the rest of his life in captivity in public attention, with celebrity visits and armed guards protection. Horn-embedded transmitters, watchtowers, fences, drones and guard dogs were also used to protect them. While Sudan's death marks an ending point for the species, he has been technically infertile for years, meaning IVF has long been the northern white rhino's last hope of survival. The only hope left for the Scientists is to develop techniques using frozen eggs and sperm which will allow the species to survive. Sudan was something of a celebrity, attracting thousands of visitors. Last year he was listed as 'The Most Eligible Bachelor in the World' on the Tinder dating app in a fundraising effort. While northern white rhinos are almost wiped out, there are around 20,000 southern white rhinos left in South Africa thanks to intensive conservation and breeding efforts. Keepers said that Sudan's death 'is a cruel symbol of human disregard for nature and it saddened everyone who knew him'. 'It may sound unbelievable, but thanks to the newly developed techniques even Sudan could still have an offspring.' If a viable embryo can be created, it would then have to be implanted into the womb of a southern white rhino, since Majin and Patu, the survivors, will likely be dead before the technique is perfected. While the southern white rhino would be responsible for giving birth to the baby, because the infant's genetic material came solely from northern whites, it would be a member of that species. However, as Save The Rhino points out, the process is fraught with difficulty and has a low chance of success. For the northern white rhino to be genetically viable a minimum of 20 healthy individuals must be born - meaning the whole process must be successfully completed 20 times - to avoid inbreeding. Then, it would be necessary to find a suitable habitat for them, since their old habitat has largely been destroyed and led the species to the brink of extinction in the first place. Sad and grim reminder of how cruel humans have been and how fighting between countries and people have affected everything else in the globe !